I spent the first 21 years of my life in Penycae, and I've written quite a bit about the village. However, over the last few months I've been putting our family tree together, and I came to realise how little I knew about the history of the area. Before Penycae became an ecclesiastical parish in its own right in the late 1800's, it was part of the ancient parish of Ruabon. In "A Topographical Dictionary of Wales, 1833 & 1849" by Samuel Lewis, he describes Ruabon as "a parish in the Union of Wrexham, containing in 1841, 11,292 inhabitants. 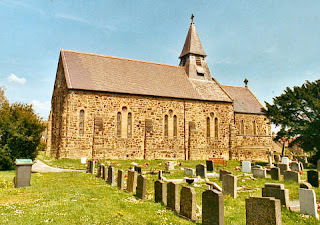 The parish is situated in a picturesque part of the county, within three miles of the great Holyhead road, and is bounded on the south by the river Dee. 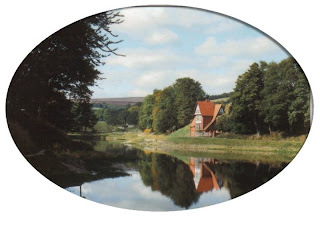 The village seems to have been indebted for its original prosperity to the noble mansion of Wynnstay, in the immediate vicinity, and to owe its present importance chiefly to the mines of ironstone and coal which abound. The parish comprises an important part of the Denbighshire coal tract, of which the principle seam is here nine feet thick; and its mineral wealth in coal and iron ore, which has caused the establishment of numerous works. The whole give employment to from 1400 to 1500 men and boys. Offa's Dyke and Wat's Dyke both intersect the parish, and in their courses approach within a quarter mile of each other, near the village". 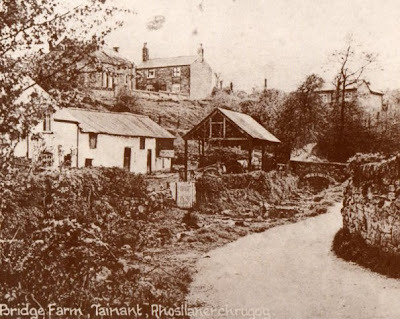 People have lived in Ruabon for over 3,000 years, and this ancient parish comprised the townships of Belan, Cristionydd Cynrig (or Y Dref Fawr), Coed Cristionydd, Cristionydd Fechan (or Y Dref Fechan or Dynhinlle Uchaf), Dinhinlle Isaf, Hafod (or Hafod y Gallor), Moreton Anglicorum (or Moreton Above), Moreton Wallichorum (or Moreton Below), Rhuddallt and Tref Robert Llwyd. The names Above and Below refer to their proximity to Offa's Dyke. ie, above it or below it. Local history did not form part of my school curriculum, so most of the above names were unfamiliar to me. Of course, I knew about Offa's Dyke, but I wasn't aware how extensive the name Cristionydd was. In Penycae, I was born into the part of the village called Pentre Cristionydd, and until I left the village, I lived in a council house on a street called Cristionydd. By the middle of the 19th Century things were beginning to change, with new ecclesiastical parishes being formed, resulting in Ruabon parish becoming much smaller. On the 24th May 1844, Coed Cristionydd and part of Cristionydd Cynrig went to the new parish of Rhosymedre. On the 3rd September 1844, Cristionydd Fechan went to the new parish of Rhosllanerchrugog. On the 28th October 1879, Moreton Above and the remainder of Cristionydd Cynrig went to the new parish of Penycae. So that's when my village became part of the newly formed ecclesiastical parish of Penycae; 28th October 1879. In anticipation of the new parish being formed, the parish church of St Thomas' was consecrated in 1878. However, at this time, most of the population of the parish were non-conformists, and attended their own Chapels. These were, Salem Welsh Baptist Chapel; Groes (Sion) English Baptist Chapel; Groes Welsh Calvinistic Methodist Chapel; Tainant Welsh Calvinistic Methodist Chapel; Soar Welsh Wesleyan Methodist Chapel, and Copperas English Primitive Methodist Chapel. Baptists and Methodists obviously abounded in my village. In "The Statistics of the Nonconformist Churches for 1905", the aggregate number of adherents for the two Baptist Churches was 449, and for the four Methodist Churches it was 577. Half of these Churches are no longer open, and those that are, do not have anything remotely like the numbers of 100 years ago. It should be said in balance that the 1905 figures were probably inflated by the Welsh Religious revival of 1904. Perhaps a word about non-conformity would not be out of place here. The Welsh have always been of an independent spirit, and have not liked been told what to do by London; be that Parliament or the King. There was also a strongly held view that every man had the right to worship God as he saw fit. An Act was passed in 1662 that required everyone to conform to the Church of England. Those who didn't were called non-conformists. Quakers, Baptists and Independents (later to be called Presbyterians) were the first Welsh non-conformist groups. Following years of persecution, which began to ease by the middle of the 1700's, non-conformity increased steadily. Researchers say that by 1851, about 75% of the Welsh population belonged to a non-conformist group. Part of the persecution was seen in the act of marriage. Between 1754 and 1837, non-conformists could not legally marry outside the Church of England - except for Quakers and Jews. This exception is for another story. Non-conformity is still very strong in Wales, and it's little wonder, as they had to fight so hard to get their religious freedom. Salem Baptist and Groes Methodist are the only non-conformist Chapels in the village with their own graveyards; adherents of other groups tended to be buried in the parish Church cemetery. Local Government reorganisation in Wales has often fascinated me. The area of Penycae has come under the following Administrative counties. Pre 1536 it was in Powys Fadog. 1536 - 31st March 1974 it was in Denbighshire. 1st April 1974 to 31st march 1996, it was in Clwyd. From 1st April 1996 it has been under Wrexham County Borough Council. For the general population of course, life goes on, irrespective of what Administrative area they are in. The same concerns require the same answers. 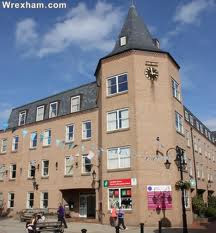 For the family historians, it also doesn't make a huge difference, as up to now the Records Offices have stayed where they are. The only thing to remember is that Denbighshire and Flintshire will not be the same during the years, as I've found out for myself. 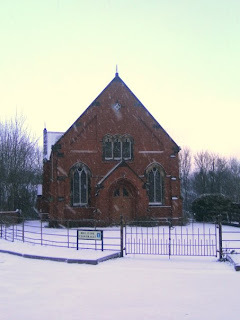 So at the present time, the parish of Penycae is in the County Borough of Wrexham. Another thing that I've learnt about the history of my village, is the place of coal over the years. Now don't get me wrong, I was well aware of coal mines such as Hafod, Bersham, and a bit further afield at Gresford, and many of my male relatives were coal miners. Hafod and Bersham mines became one when they linked the seams together, and one of the seams actually ran under the village of Penycae, which caused some subsidence where we lived at Cristionydd. The mine was closed in 1964. Gresford was a large coal mine, and suffered one of the worst mining tragedies in British mining history, when in September 1934, at about 2.00am, an explosion rocked the mine killing 266 men, with only 6 men on that shift surviving. Only 11 bodies were ever recovered, and that section of the mine was never re-opened. The whole place was closed in 1973. We were well aware of the dangers of coal mining, and family after family dealt with either the loss of a loved one in the mine, or watched them suffer for years the effects of dust on their lungs. But what choice did many of them have? There were no alternatives, but stories abound of comradeship and humour between coal miners. I didn't know anything about the smaller mines in the village, which began I think in the 18th and 19th Centuries, and which were long gone by the time that I was born. A list of Denbighshire coal mines in 1896 didn't have any of them listed. However, another list (see here) said that there were mines at Afoneitha, Bryn-y-Felin, Cristionydd, Fronheulog, Groes, Mill, Mountain Level, Plas Issa and Stryt Issa, with a Zinc mine at Copperas. I have no idea of when they started, or how long they lasted. What a thriving little community it once was. The above information is probably of interest to a limited audience, but for me, it is another insight into the village in which I was born and brought up. 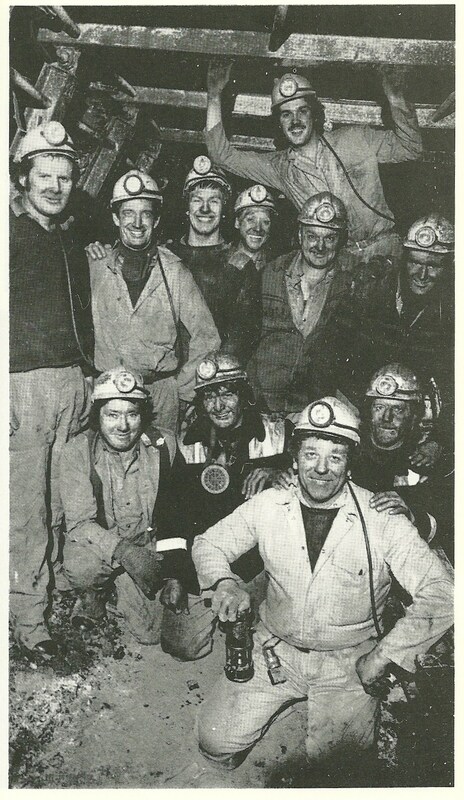 my Taid is in the pic of the Miners at Bersham. top row, fourth to the right. (to the left of the one hanging off ceiling). Emlyn Davies. I know this same piture was published in 'Clatter of Cloggs'. Does God Intervene in the Affairs of Men?